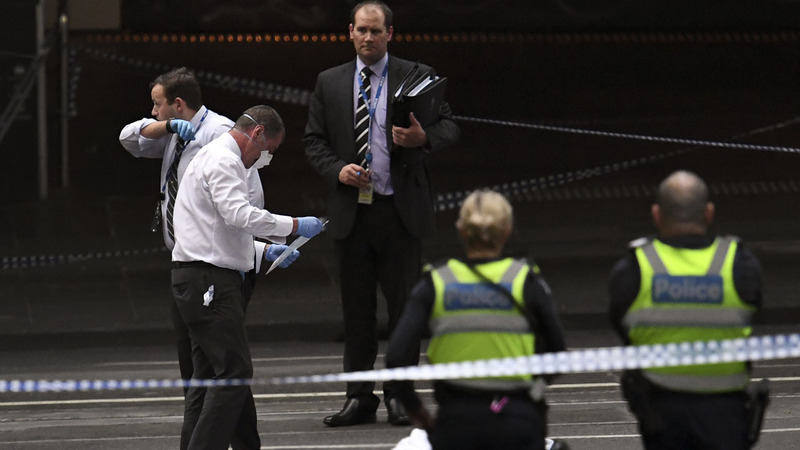 A knife-wielding man killed one person and injured two others in a rush hour stabbing rampage in downtown Melbourne Friday, before being shot dead by police. Counter-terrorism police and intelligence officers are still piecing together how the incident occurred, but it is known the attacker drove a 4×4 truck loaded with gas bottles into the bustling city centre at around 4:00 PM (0500 GMT) on Friday evening. Witnesses said the man — who was wearing a dark tunic — attacked members of the public in a popular shopping district with a knife as his vehicle was ablaze, before being confronted by police. One person died at the scene and two others were being treated for their injuries. Witness footage showed police struggling for at least a minute to corral the towering man as he lunged, slashed and stabbed wildly at two officers. At least two members of the public bravely stepped in to help police. One man was armed with a cafe chair while another — swiftly dubbed an “Aussie hero” on social media — repeatedly tried to ram the suspect with an empty metal shopping cart. But as the attacks continued unabated, eventually one officer opted for lethal force, shooting the suspect in the chest. He later died in hospital while under armed guard. “We are now treating this as a terrorist event,” said Victoria Police Chief Commissioner Graham Ashton, who said the suspect was “someone that is known” to police through family connections. The unnamed assailant was said to reside in Melbourne’s northwestern suburbs but had come to Australia from Somalia in or around the 1990s, when the country was ravaged by a civil war. Officers said they “are not looking for anyone further at this early stage” and there was no immediate evidence of an ongoing threat related to the attack. Forensic investigators combed through the scene late Friday, where the dead victim’s body lay covered in a white plastic sheet. Melbourne is Australia’s second largest city, a cosmopolitan metropolis of almost five million people famed for its cafes, bars, restaurants and high standard of living. Friday’s attack is a double blow for the city as it coincides with an ongoing murder trial of 28-year-old James Gargasoulas, who ploughed his car into crowds in the same area in 2017, killing six people. State Premier Daniel Andrews described the attack as “evil” but said the city would not be bowed.